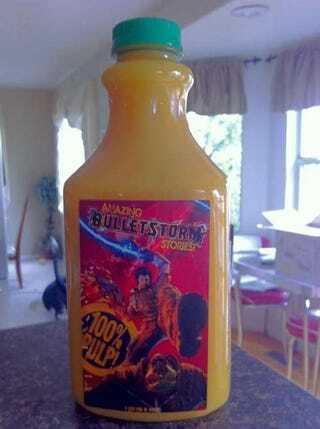 Unlike the package of bullet-riddled rotten meat sent to my house earlier this year, this jug of Bulletstorm Orange Juice promises to deliver Amazing Bulletstorm Stories! packed with 100% PULP! "Bulletstorm was written by Rick Remender, author of the Punisher. Bulletstorm takes players on a pulp-filled adventure filled with plot twists and turns from betrayal, revenge and redemption. Set in a futuristic utopia, an elite peacekeeping force thwarts the rumblings of civil war. But Deception within the ranks has caused two members of the most feared unit to strike out on their own. Now stranded on an abandoned paradise, Grayson Hunt and Ishi Sato find themselves surrounded by hordes of mutants and flesh eating gangs. They survive on two objectives: Get off the planet alive and exact revenge on the man who sent them there." Oh, also each 8 ounce serving contains 110 calories and 2 grams of protein... among other things.